Meal courtesy of MUGA Ramen Bar. 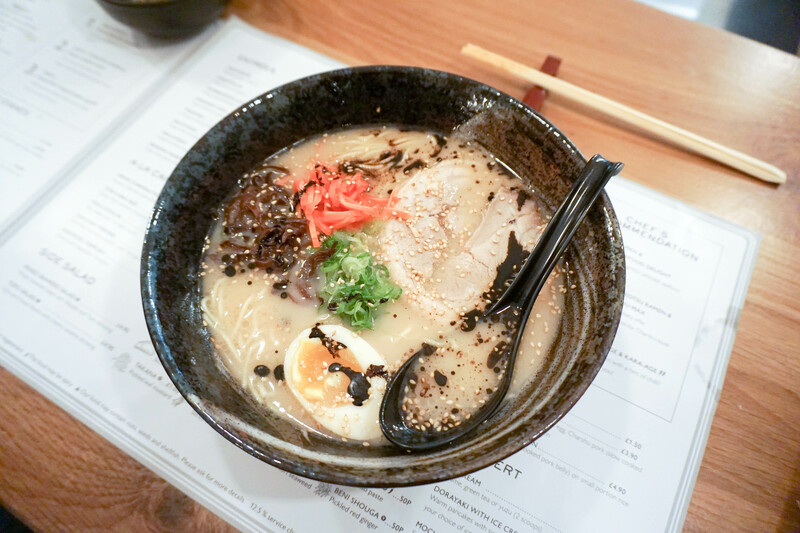 A ramen bar and an open kitchen with minimalist design is situated on Panton Street, a new opening for 2015, MUGA Ramen Bar. 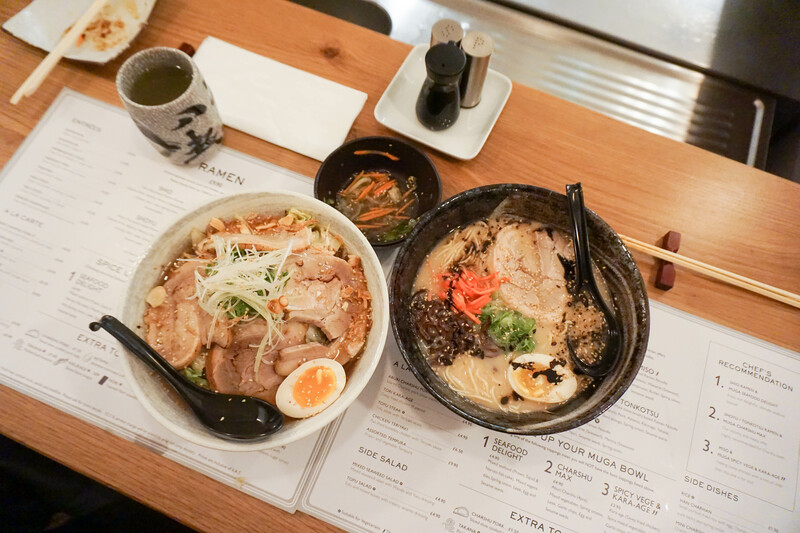 Joining the ramen craze alongside the front runners Kanada-Ya and Ippudo, London is spoilt for choice when it comes to this particular Japanese specialty. Upon entry I was greeted with the usual ‘irrashaemase’ which means welcome in Japanese. something of common courtesy in Japan, which has been well adapted here in London! As I walked in, I soon realised I was the only one in the restaurant, awkwardness crept over me as I worried about the quality of the food and why it would so empty in the early evening. By the end of the meal however, groups of people seated themselves behind the counter as the night seeped in. A very convenient spot at the heart of the West End Theater District, food is served quickly and in generous portions. The prices are also very competitive too! Deep fried whitebait in vinegar sauce topped with spring onions and slices of carrot. 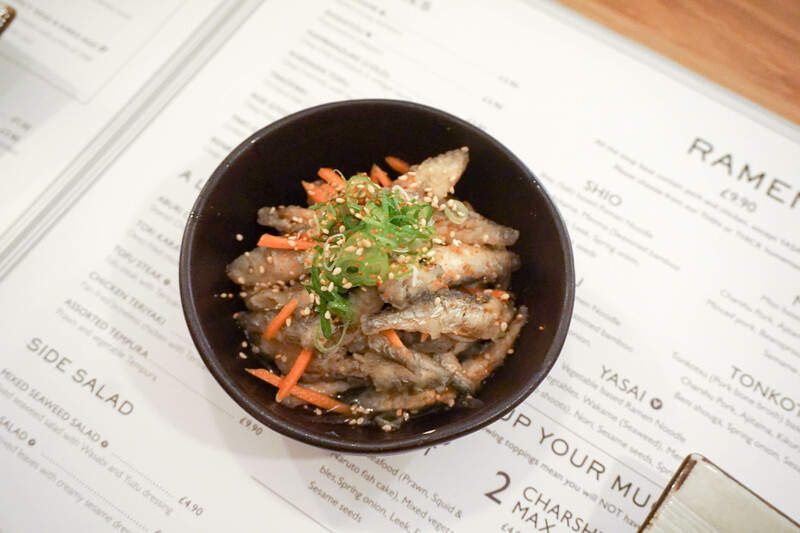 I think it was the first time we had whitebait in that style, not too fishy and perfect for sharing as an appetizer. This was one of my favourite things on the night and I’m also weak towards takoyaki (fried octopus in batter). Served elegantly on a marbled plate topped with Japanese mayonnaise, takoyaki sauce and Katsuobushi. 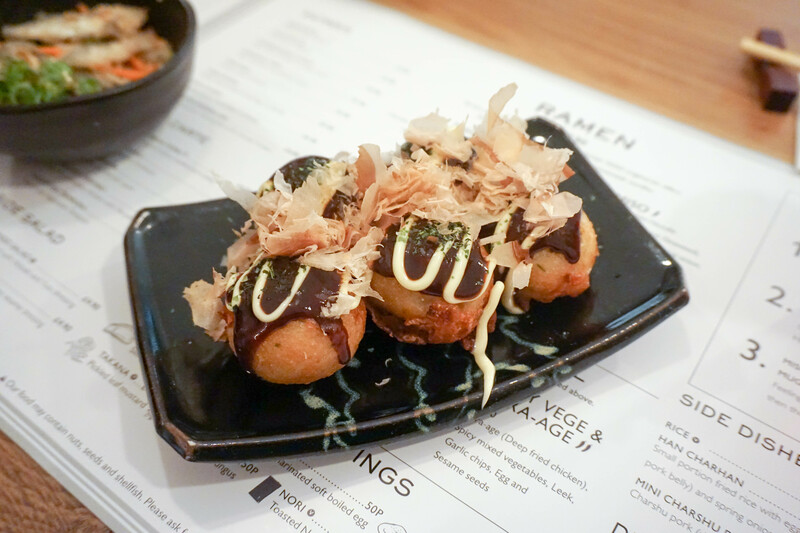 The actual takoyaki balls are dashi flavoured batter with bits of octopus meat inside. Definitely a must-try! 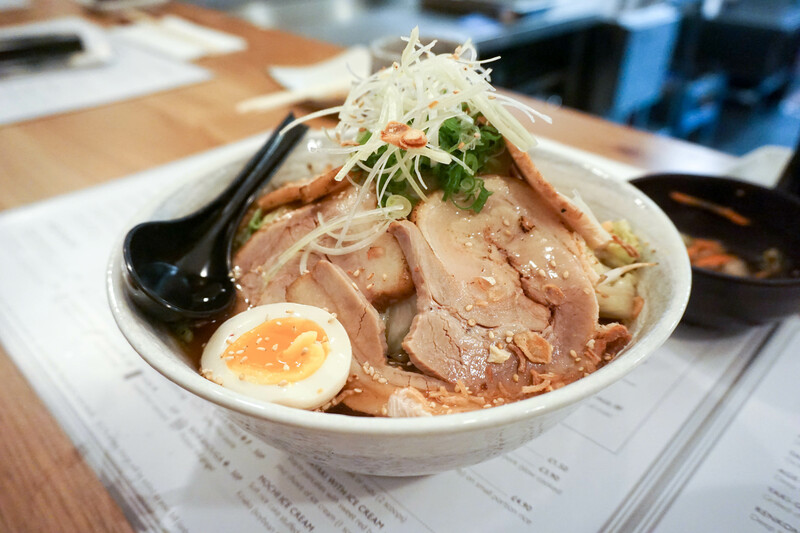 Many ramen joints in London specialise in particular traditional Japanese noodles such as tonkotsu however, MUGA serves a variety of traditional style ramen. You could have a chance to try salt (shio), soy sauce (shoyu), miso or tonkotsu based noodles with various sizes of thickness. When the shoyu based ramen with charshu topping came, exquisite presentation wasn’t the only thing we were surprised about. The rolled charshu layered up in circular form topped with freshly cut spring onions is a definite jaw dropper! The charshu itself was tender and soaked in broth for a number of hours meant it just rolls of your tongue. Massive portions! Compare that to the cup of tea! Being full by this point was an understatement but we had to try some desserts. 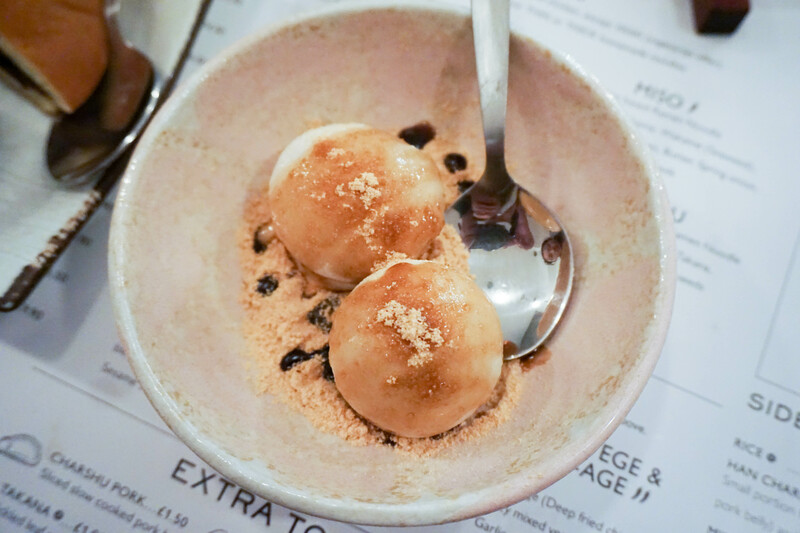 The mochi ice cream consists of soft rice cake stuffed with vanilla ice cream, topped with Kinako (soybean powder) and Kuromitsu (molasses sugar syrup). The mochi ice cream was too frozen and slightly hard on the teeth but with kinako powder was an added bonus and wins me over any day! 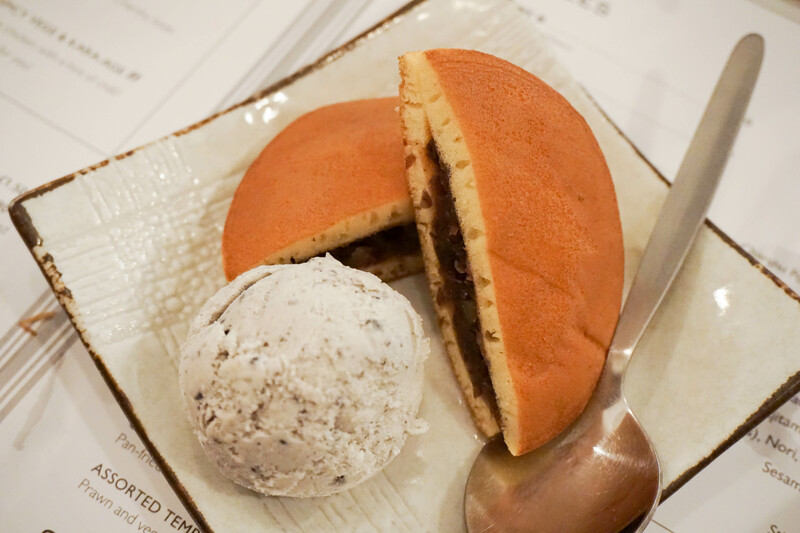 I admit I’m not a fan of dorayaki in general since I’m not so fond of the texture, but at MUGA, the dorayaki is served warm with a generous filling of azuki allowing the dessert to be light and sweet at the same time. Service: It’s quite a large ramen bar place but the waiters friendly. Minimal interaction but attentive. 12.5% service charge.